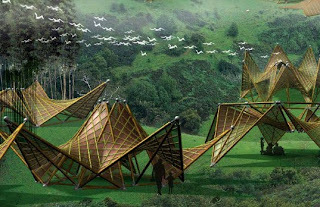 Art-C: The folding bamboo house.....a creative & eco-friendly architectural design initiative!!! The folding bamboo house.....a creative & eco-friendly architectural design initiative!!! As the name suggests, these houses inspired by the art of origami are created from bamboo & are intended to be used as a temporary shelter in the aftermath of an earthquake. They are elegant & beautiful & are the brainchild of Ming Tang, an architectural designer who has designed them making use of renewable materials. Ming Tang came up with this idea after a magnitude of 7.9 earthquake struck central China in May 2009 killing nearly 69,000 people. On learning that the Chinese Government planned to create about 1 million temporary homes, he designed a shelter that was cheap, easily produced & environment friendly & at the same time which can be folded into a variety of structurally sound shapes. Going by the design of the house, Ming aims to have achieved what he set out to do thus creating houses that are dynamic & easily adaptable to different situations. The concept utilises bamboo poles which are pre-assembled into rigid geometric shapes. This geometry provides each structure's integrity thus allowing a range of lightweight modular structures to be quicky assembled depending on the need & transported to their final destination when required. Once constructed, the shelters are then covered using re-cycled paper making the whole process eco-friendly. There is no doubt that such a product will have a huge impact both in terms of the environment & also considering the fact that earthquakes are no more a rarity in different parts of the world! !